For Venezuela's Hugo Chavez, A Second Life On The Small Screen : Parallels A new TV series recounts the life of the late strongman — and suggests his rule laid the groundwork for the food shortages, hyperinflation and political polarization plaguing Venezuela today. 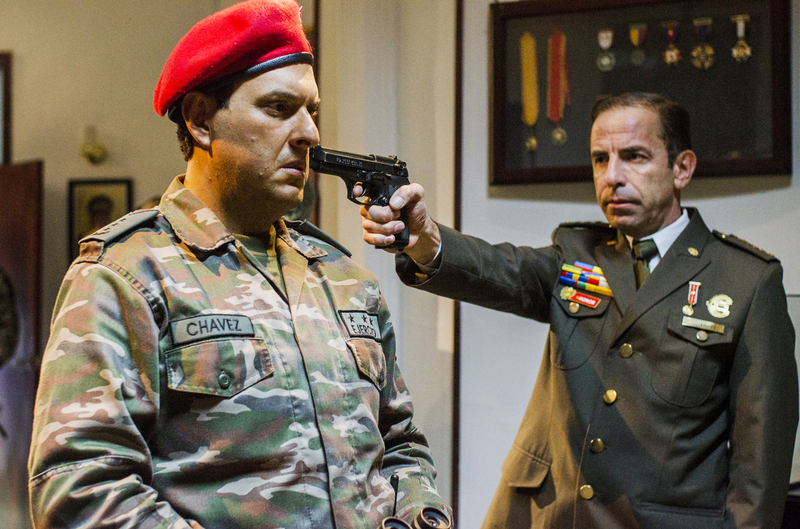 Colombian actor Andres Parra (left) plays Hugo Chavez in the new telenovela, El Comandante. Venezuelan leader Hugo Chavez, who died of cancer in 2013, is coming back to life – on television. A new Spanish-language series, from Sony Pictures Television, recounts how Chavez rose from obscurity to carry out a socialist revolution in his homeland. But even before hitting the airwaves, the series, called El Comandante, has sparked controversy – because it shows how Chavez set the stage for Venezuela's current crisis. Colombian actor Andres Parra plays Chavez, the firebrand leftist who ruled Venezuela for 14 years. To prepare for the role, he listened to 400 hours of Chavez's speeches and worked with a voice coach. His bulky frame, curly-haired wig and prosthetic chin make him a dead ringer for the Venezuelan strongman, right down to his mimicking of Chavez's insults of former President George W. Bush as a "donkey" and "the devil." In an earlier Colombian TV series, Parra played drug lord Pablo Escobar. But he finds Chavez even more fascinating. While the Venezuelan leader was dying of cancer, "He made this speech," Parra says. "It was [a] nine hours, 46 minutes speech. Without pee or drinking or anything. It was a way, like, to show people, 'I'm here. I came back. And I'm strong.' "
In El Comandante, Parra first depicts a young, idealistic Chavez escaping poverty by joining the army and being elected president with the backing of Venezuela's poor. Eventually, Chavez morphs into a power-hungry authoritarian. The series suggests his rule laid the groundwork for the food shortages, hyperinflation and political polarization plaguing Venezuela today. Looking back on the Chavez years has proved highly emotional for Henry Rivero, the series director, who grew up in Venezuela. "It's been very hard for me," he says. "I cried a lot, most of the time. Because, you know, you understand how tough [was] the situation we went through all those years." The 60 episodes of the series — which premieres in Latin America this month and on Telemundo in the U.S. in the spring — are being filmed in Colombia due to the hardships of working in neighboring Venezuela. What's more, that country's socialist government has branded the project a hatchet job. "They are going to emphasize the bad and make the world think that Hugo Chavez was a barbarian," pro-government lawmaker Diosdado Cabello said in a recent speech. Meanwhile, Venezuelans who despise Chavez have also come down hard on the actors. "They say I should be ashamed of myself for acting in this series," says Vicente Peña, a Venezuelan who plays a military attache in El Comandante. But for Parra, playing Chavez is the role of a lifetime. "It shows you so much things about the human tragedy," he says. "Of how we change. You see ambition but at the same time you see compassion. He has everything. For an actor, that's delicious."